The P.S.P.D. is dedicated to many issues and concerns relating to the English language including punctuation and spelling as well as general written language use and abuse. The Apostrophe Squad deals with apostrophe protection issues. If you identify with this struggle against injustice, or know someone who does, you can join. Just buy the t-shirt. T-shirt costs: $25.00 (Canadian) or $27.00 (US) including taxes, shipping & handling (cheque or money orders only). Please inquire for prices when shipping more than two t-shirts. Sizes available: Medium, Large and Extra Large. Other sizes: Small, 2XL, 3XL and 4XL: please inquire. 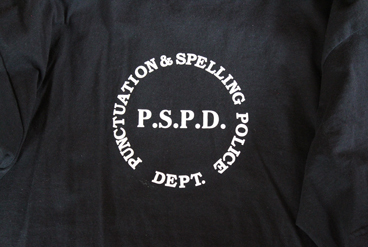 The front of the T-shirt reads: "P.S.P.D.- Punctuation and Spelling Police Department." 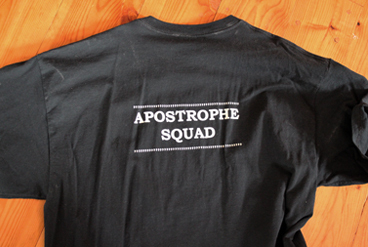 The back reads: APOSTROPHE SQUAD. The world's most respected organization dedicated to the preservation of apostrophe integrity. 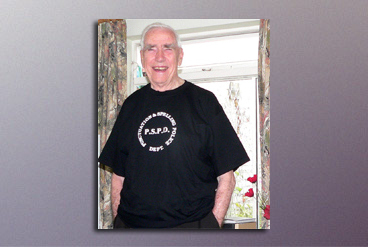 The above photo shows John Richards of the Apostrophe Protection Society - a happy recipient of an Apostrophe Squad t-shirt. And Yes, There is a Theme Song! "The Apostrophe Squad Theme Song" is recorded on Dear Friends & Gentle Hearts. The lyrics to the song are here.